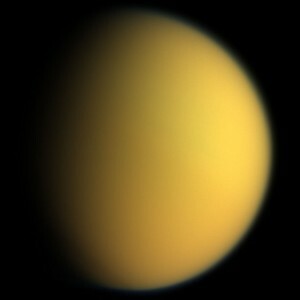 This natural color composite was taken during the Cassini spacecraft’s April 16, 2005, flyby of Titan. From http://en.wikipedia.org/wiki/Titan_%28moon%29. Interesting public talk to the National Capital Astronomers‘ monthly meeting from Prof. Doug Hamilton of UMD Astronomy. Prof. Hamilton talked about the origin of Saturn’s moon Titan, an unusual satellite in several ways. Titan has a massive nitrogen and methane atmosphere, full of orange photochemical haze (picture at left). Prof. Hamilton pointed out that that Saturn’s satellite system is also unique among satellite systems of giant planets: unlike the Jovian and Uranian systems, Titan is the only large moon, and it is very far from the next largest moons in the system. Instead of forming along with its host planet, as the Jovian and Uranian satellites probably did, Prof. Hamilton suggested that several smaller satellites originally formed around Saturn. Then the moons’ orbits destabilized, and the moons collided, merging to form Titan. This novel hypothesis solves several outstanding questions about Titan and highlights how much we still don’t understand about our own solar system. Geometry of the mutual occultations of Sila and Nunam (called “mutual events”) over the last few years. From http://www2.lowell.edu/users/grundy/abstracts/figs/2012.Sila-Nunam.gif. Interesting talk today in the DTM Astronomy Seminar from Dr. Anne Verbiscer of UVA Astronomy. She spoke about the Kuiper Belt binary object Sila-Nunam, two enigmatic bodies orbiting 40 times farther from the Sun than the Earth. They have radii of about 100 km, comparable to some of Saturn’s small moons, and they orbit one another every 12 days, as they both go around the Sun together every 300 years. In recent and coming years, Sila and Nunam will occult one another several times, allowing astronomers to measure their radii, which aren’t very well known, and learn about their densities, internal structures, and orbit. Dr. Verbiscer presented several very interesting infrared spectra and observations in visible wavelengths, showing the small dips in light from the system, as one object blocked out the other object. These observations are very challenging because objects are so small and far away, but analysis of these data are ongoing and will tell us about these strange, distant, and cold objects. Interesting seminar by one of DTM‘s own postdocs, Dr. Liyan Tian. At a subduction zone, one plate of oceanic lithosphere dives under another plate, which ‘dewaters’ to plate (blue arrows) into the overlying mantle wedge and produces arc volcanism at the surface. Part of the hydrated mantle wedge frees itself and mixes into surrounding depleted mantle. From Widom, Nature 443, 516-517 (2006). Dr. Tian described how she uses the geochemical compostions of basalt erupted from and near mid-ocean ridges to study the composition and transport of material within the Earth’s mantle. One element that is particularly important for her studies is lithium (Li). 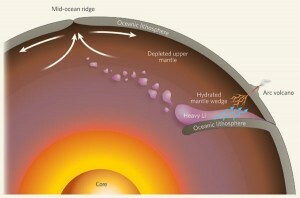 Dr. Tian described how Li is thought to behave chemically within the mantle in a way that allows her to trace the subduction of material into the mantle and show that it is later erupted at a mid-ocean ridge (illustrated at right). Fig. 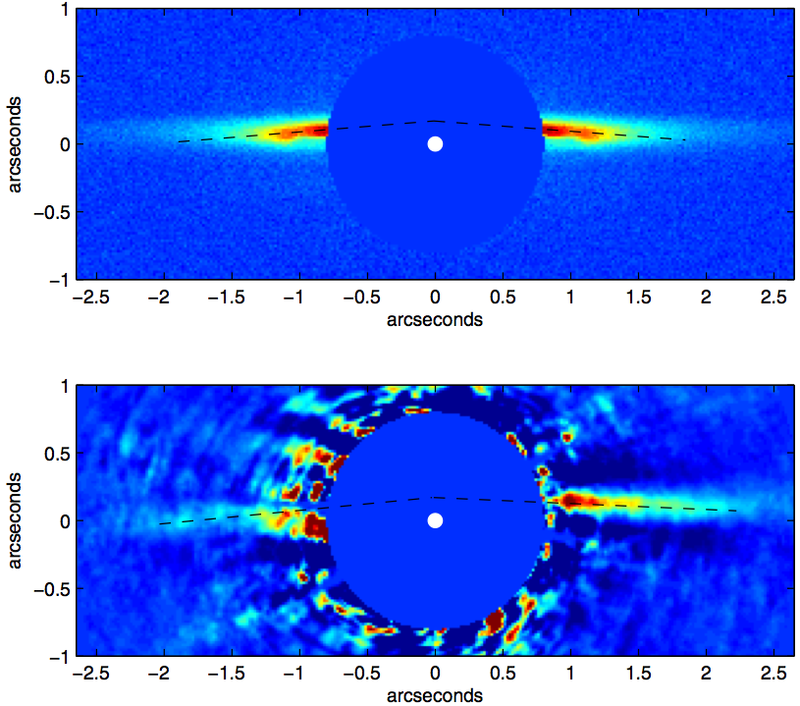 3 from Mandel+ (2013) showing the combined-light time series for WASP-12 during transit. Very cool result that, for some reason, only just appeared in the press. 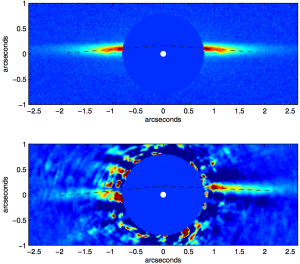 Using the Hubble Space Telescope, Avi Mandell and co-authors detected spectral signatures of water in the atmospheres of several very hot, transiting exoplanets. The figure at left shows the transit signal for WASP-12 b, a very hot gas giant planet that is so close to its host star that the star may be ripping the planet apart. To get a sense for how impressive these detections are, consider the following: given the temperature and radius for the host star WASP-17, which is about 1,000 lightyears away, we receive about 1 pico-Watt per square meter from the star here on Earth [ (1.38 R_sun/1000 lightyears)^2 (sigma) (6509 K)^4 ~ 1 pW/m^2]. That’s about the same amount of energy we’d receive from a 1000-Watt lightbulb suspended in space 10,000 km from the Earth [1000 W / 4 pi (10000 km)^2 ~ 1 pW/m^2]. The planet WASP-17 b has a radius roughly a tenth that of its host star, giving a transit depth [(radius of the planet)^2/(radius of the star)^2] of about 1% (as seen in the figure). For comparison, the radius of a standard lightbulb is about 3 cm and that of a fruitfly is about 2 mm. 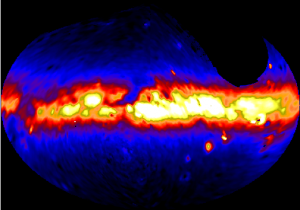 So being able to measure a spectrum for WASP-17 b in-transit is a bit like watching a fruitfly pass in front of a lit lightbulb at a distance of 10,000 km from Earth and being able to tell what color the fly’s wings are. Very cool stuff. Mandell’s paper is here: http://adsabs.harvard.edu/abs/2013arXiv1310.2949M.